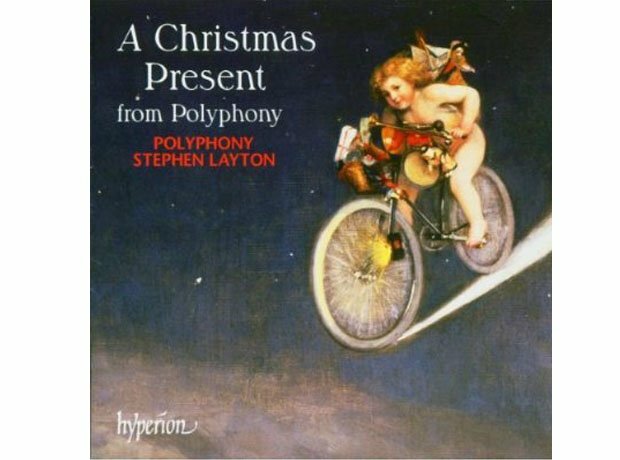 This one wins the cover art prize for its fanciful depiction of a cherub cycling in the sky, but that doesn't take attention away from the incredible music from Polyphony and Stephen Layton. The legendary Three Tenors made their play for the festive season with this fantastic collection of Christmassy favourites. Adeste Fidelis, Silent Night, Oh Tannenbaum… classics old and new are given the tenor treatment. There's something about the sound of a Welsh Male Voice Choir that sets them apart from other types of ensemble. And if you're as addicted to that sound as we are, then you'll love this mammoth festive collection. Another fantastic piece of festive cover art - just look at that knitwear! The track listing is pretty good too, with guest spots from tenor Rolando Villazon and harpist Catrin Finch. Delightfully cosy listening and with a high Welsh-language content. The great Leroy Anderson skips merrily through the Christmas standards with the help of the Boston Pops Orchestra. Delightful arrangements of all the classics that are bound to have you rocking around the Christmas tree. Well, dancing round it at least. Looking for traditional carols sung beautifully? Look no further than this perennial favourite, with Sir David Willcocks presiding over the magnificent King's College Choir for classics like Once In Royal David's City and O Little Town of Bethlehem. Nigel Hess' piano versions of Christmas classics is definitely one for after the wrapping paper's been thrown out and you've put the dishwasher on. Perfectly blissful and relaxing once all the stress of Christmas is out of the way. The South-London boys' choir tackle all the Christmas bangers - Once In Royal David's City, O Holy Night, and even a take on Have Yourself a Merry Little Christmas. She turned on the Classic FM Christmas music this year with Jamie Crick, and so our Katherine is a natural choice. Her Christmas album is full of old favourites, but the stand-out is a haunting O Come O Come Emmanuel. This one does exactly what it says on the tin. Want to hear all your favourites played impeccably by one of the best orchestras in the world? Look no further. They do a cracking version of Little Drummer Boy. Trevor Pinnock and The English Concert take a refined look at Christmas Concertos from the baroque masters. So that's Vivaldi, Handel, Corelli and plenty more. Another spin on all those Christmas carols you know and love. As Classic FM's Composer in Residence, Howard Goodall gathered together a top-notch ensemble to produce a gorgeous album, perfect for an especially tranquil Christmas. If you've ever sung in a choir, you'll know that Christmas isn't Christmas without at least a little bit of John Rutter. His unique melodic skills are put to amazing use and, thanks to The Cambridge Singers, sound magical. The Peruvian tenor takes us on a personal journey through Christmas. With a voice like his, carols and songs like O Holy Night and O Come All Ye Faithful sound unbelievable. And no, we didn't pick it because the name sounds a bit like 'Santa'. The RPO, the Cambridge Singers and John Rutter. What more could you want? Another Rutter entry in our guide, but he's pretty much the King of Christmas music so we thought he deserved a second spot. You'll see why when you listen!